Ok, so what do we know about that beast ? It will be officially released in this November. 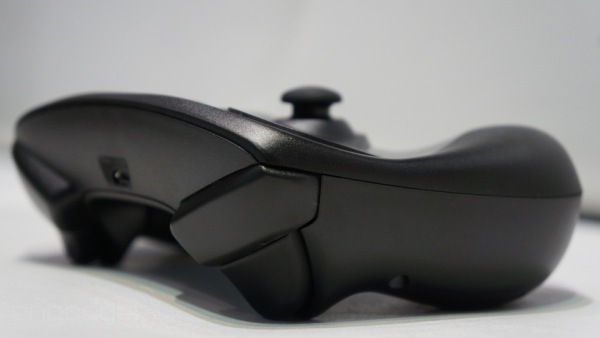 It features two haptic touchpads, one analog nub, and 7 face buttons. It will cost about 49 USD, in the US. Not sure about the price anywhere else. 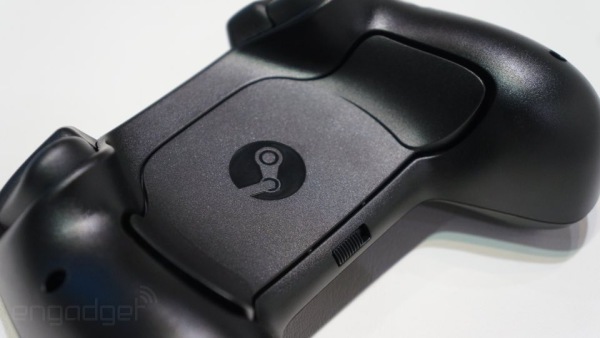 It will be required for all machines sold as “Steam Machines”. Polygon had nothing interesting to say about it. How do these guys make a living ? This is what this fat boy looks like from the side: shoulder buttons are nice and big. 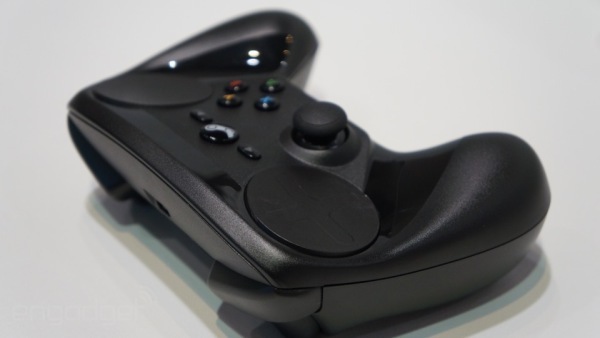 The back side sports the Steam logo, and acts as a battery cover. 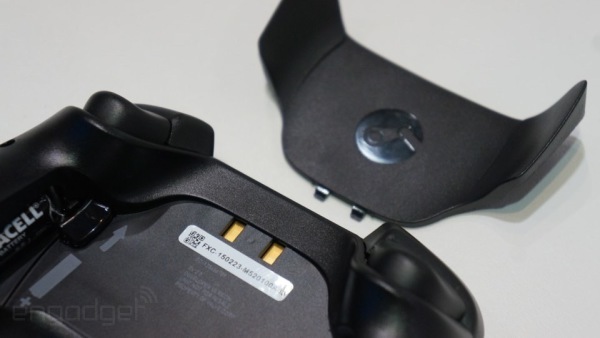 Apparently the controller uses usual-sized batteries, just like the Xbox 360 controller. Mmm, I hope that cover is solid enough to survive hundred of removal-insertion cycles. And there you have it: As you can see with the hands on it, it does not look as huge as you could imagine when you just see the controller alone. 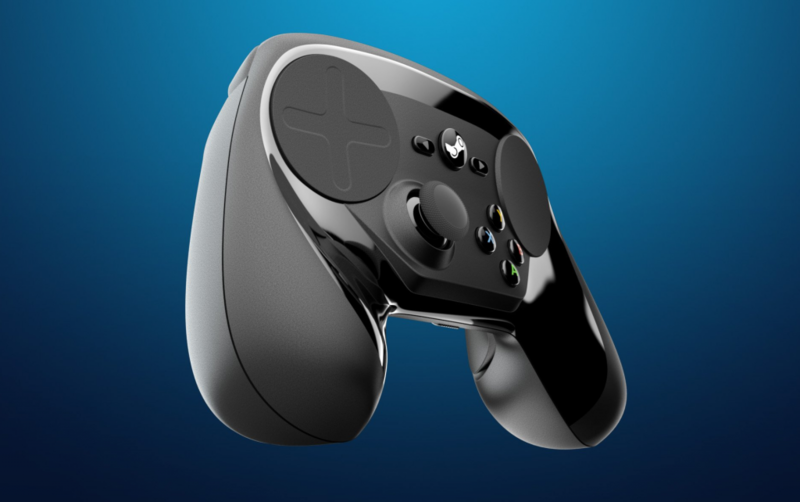 My main issue with the Steam Controller is with the right side — the action buttons are positioned where the second analog stick would usually reside, with the trackpad above. Historically, gamepads have trained players to control movement along the bottom of the controller, and to jump up to the action buttons. The Steam Controller reverses this instinct, and it’s not something I could overcome in the time I played with it. This disconnect made tutorial stages of The Talos Principle, a philosophical puzzle game, frustrating, as my character walked clumsily around the environment, taking seconds longer than usual to pick up objects and activate them. There you have it ! My take on the controller: it’s probably not perfect but it’s a good first try. Developers will have to start working to support it appropriately anyway, so I would not expect all games to work “magically” with it – how sensitive and how precise it needs to be for each game will differ. But that’s the beauty of Valve’s approach, providing everyone with the ability to share and download other user’s specific per-game setups for this controller. I still think it lacks a mini-keyboard, since a number of games probably require more than just a few buttons (such as Simulators and the more complex shooters), but I hope Valve has something in mind for those games as well. 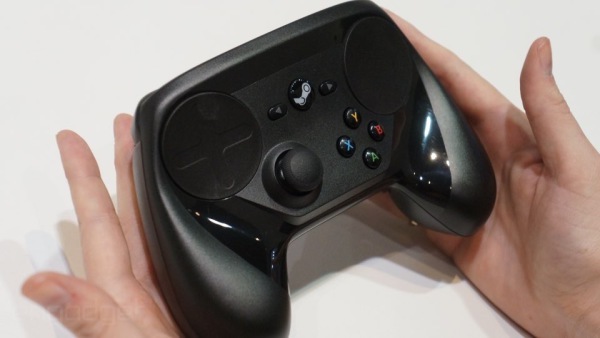 On a side note, we have just had more GDC2015 news, with an avalanche of AAA titles announced for SteamOS/Linux. What I dislike about this controller is the noise the buttons make, and the fact it’s not available in a wired version.